I’ve decided to occasionally link to other indie/semi-indie games I’ve been playing and enjoying, just to share the love. Reciprocity would be cool, but honestly I wouldn’t be surprised if quite a few of these people don’t even notice the linkage. I’m just doing this for the good of the indie game scene. This might seem odd, but I’m really not afraid of “competition” – I don’t think other indie games would stop people from playing Frogatto. The cost isn’t exclusionary on mobile games, the time taken by story-driven games leaves you with plenty of time to play the others, and I just think there’s so much more to be gained by cooperation. There’s a short supply of really well-made indie games, and I want to see our art form thrive – I want to see other teams, who’ve put their heart and soul into it, succeed. 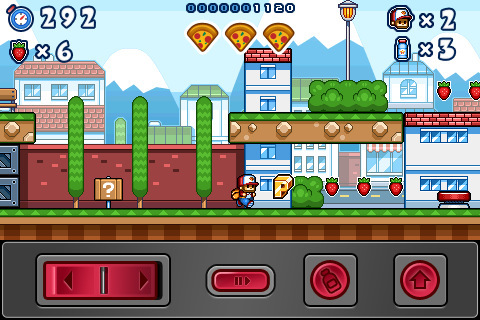 So the first one is a game I’ve been playing on my iPod called Pizza Boy, which is a platformer, but is really, really different from Frogatto in almost every way. It’s very much in the Mario Bros vein of things – rather similar physics, timed-levels, worlds with four stages, and a lightly-handwaved story. It also shares the mario trope of killing enemies by jumping on their heads (which we use somewhat sparingly in frogatto). The whole game is built around some pretty tight platforming challenges, where each level is an exacting sequence of running and jumping sequences you have to figure out by trial and error, and then play back with crackerjack timing (quite unlike frogatto, which generally allows you to stop and smell the roses). Unlike mario, it’s quite forgiving because you can start at any level you’ve been on before (which probably defeats the purpose of having ‘lives’, but there they are anyhow). I like it – it’s frustrating, but frustrating in a good way. One thing that’s great about it is a common mobile-game trope – there’s not much you have to remember (as you would in a complex, story-driven game like an rpg), so it’s really easy to get into if you’ve got a few minutes to kill. You don’t have to re-familiarize yourself with some big complex set of info (like, say, which items you’ve acquired, or which quest you’ve completed). I know from personal experience, that this can be a bit of a bugaboo if you haven’t played a game for several days or weeks (I definitely have had at least one RPG I’ve entirely started-over because I lost track of what I’d accomplished). I don’t wish all games were like this, but it really is nice for some games to be immediately accessible. Also interesting to see another title doing the Left/Right controller scheme, rather than a full virtual Dpad. Seems to be gradually becoming an accepted/best practice for these kinds of games. We adopted it quite a while back (I believe sooziz was the title that inspired us to do so), because having up/down arrows between L/R, or having a full, plus-shaped dpad makes your touch areas for the side keys way smaller, and especially the U/D between L/R setup makes it possible to hit up or down by accident when “hat-switching” over to the opposite side – in a lot of games, this can really trip your character up. So there’s Pizza Boy. Check it out! This entry was posted on Sunday, July 1st, 2012 at 4:52 pm	and is filed under Uncategorized. You can follow any responses to this entry through the RSS 2.0 feed. Responses are currently closed, but you can trackback from your own site. I wonder if the controls are OK for me. It’s always a problem on my iPod. This game looks pretty badarse!